Chairs and settees come in a variety of manufacturing materials and finishes. There are many types of cloth, leather and vinyl chairs and settees which require a gentle and specific cleaning approach to achieve the best possible results with no damage to the fine fabrics and finishes. Our expert cleaning technicians will review the material and the condition of the given piece of furniture in order to formulate and apply the right cleaning solution for best results, this is quite important as different fabrics and materials respond in different ways to certain cleaning methods. You can be sure our specially trained cleaning teams will do their best to achieve quality, lasting results. Quality furniture is a major home investment and its cleaning maintenance should not be just left to anyone. We can guarantee the sound technical knowledge and extensive industry experience of all our cleaning technicians, this is why we recommend to use professional grade cleaning service and ensure your peace of mind. Paying some cleaning attention to sensitive settees and chairs will not only keep them looking better for longer, but it will also ensure better hygiene and health around the house as the dust mites and many bacteria lurking in nooks and crannies cannot be eradicated in any other way but using professional grade cleaning. When you think about it, it’s a small price to pay for peace of mind and the better health of your loved ones. Cleaning of such furniture pieces is recommended at least twice a year, especially if you have allergy prone individuals living at the house. As with any of our other cleaning services, the chair and settee cleaning is performed using non-toxic, environmentally friendly materials which are also biodegradable and leave no residue or nasty smells in the air. Your furniture should be ready to use in a matter of hours as our cleaners will extract any leftover moisture for extra hygiene and comfort. The service runs seven days a week with no extra charges for weekend appointments. Call us today and enjoy professional clean furniture. Dining room chairs and settees are generally considered to be delicate and beautiful pieces of furniture which are valued for both functionality and they good looks. This is why it is highly recommended to have them professionally cleaned as this will yield excellent cleaning results and cause no damage to any of the sensitive fabric finishes or other parts of the furniture piece itself. There are many types of cloth, leather and vinyl chairs and settees which require a gentle and specific cleaning approach. Our specially trained cleaning technicians have excellent technical knowledge and sufficient prior experience to be able to deliver fast, efficient results without damaging the fabrics. We train our cleaning crews to review and determine the level of staining or damage the chair or settee has sustained, and depending on the type of fabric or material, the cleaners will then administer the most effective yet sparing way to clean the material successfully, and this is quite important as different fabrics and materials respond differently to certain cleaning methods. We understand that quality furniture for the home is a serious financial investment and the last thing you need is furthering the damage or staining, but our customers can be sure their delicate fabrics and materials are in good hands and will be treated accordingly, our cleaners have received top level training for customer peace of mind, and ours too. Looking after chairs and settees professionally is great for their good looks but also assures better hygiene as fabric finishes and other similar materials accumulate and facilitate the growth of certain molds and household bacteria which over time may pose a health risk to your family. Such problems are only dealt with effectively through professional grade cleaning so don’t put a price tag on your family’s health and wellbeing. Naturally, the chair and settee cleaning is performed using non-toxic, bio degradable materials and products which will leave no trace or residue on the furniture itself or the room in general. For best results and maximum hygiene it is recommended to have the professional grade cleaning done twice a year. Dining chairs and settees are delicate pieces of furniture, usually finished with a sensitive fabric or material finish which doesn’t take long to show signs of everyday use and some soiling. As these pieces of furniture are somewhat expensive and in some cases even custom made, it makes sense to entrust their cleaning to the right people and leave nothing to chance. We can offer our customers top of the range, professional chair and settee cleaning able to lift off and remove even the most stubborn of stains, even from the most sensitive of fabrics. It is recommended to avoid home treatment of stubborn stains of chemical or organic nature as this will only cause more damage, we strongly advise customers to call us and let us take care of this high responsibility, complex task using professional grade cleaning equipment and expert technical knowledge. Our cleaning crews will approach the task with all due attention and care in order to deliver fast, high quality results with no risk of damage to any of the fabrics or the rest of the furniture piece itself. More so, different types of fabrics and material finishes respond differently to cleaning attempts, so take the guess work out of cleaning and let our technicians determine the type of fabric, the level of soiling and the most appropriate cleaning technique to be used for best results. Keeping such pieces of furniture clean on a regular basis will actually increase the overall level of interior hygiene around the house as they collect a great amount of dust and bacteria in nooks and crannies where the fabric joins wood or metal. The professional chair and settee cleaning service is performed using top level equipment and non-toxic, eco friendly cleaning materials which pose no health risk to humans or animals living at the property. The cleaning materials will leave no nasty smells or residue in the fabric itself or the rest of the furniture piece. 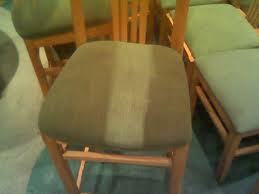 Your furniture should be ready to use in a matter of hours as our cleaners will extract any leftover moisture.